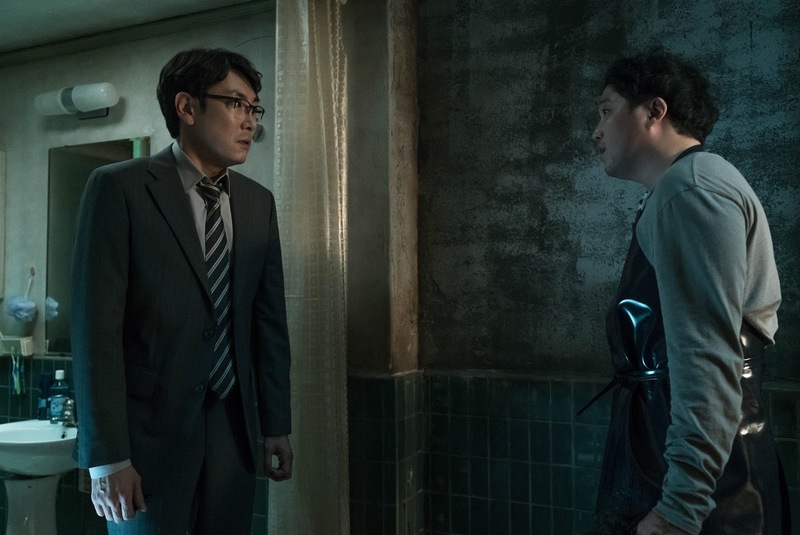 The debut feature film of writer/director Lee Soo-yeon is a psychological thriller that is full of twists and turns that will make one's head spin. There is a lot going on in this movie, but if you bear with it, it will all make sense, sort of, in the end. Technically it's nicely atmospheric as scenes shift with the character's perception of reality. But sometimes, it gets muddled down in trying too hard to be complex. Cho Jun-woong (The Handmaiden), plays Dr. Byun, a once successful doctor in Gangham who lost most of his wealth to pay alimony to his recent ex, and loan sharks. He now works in a country clinic performing mostly colonoscopies to senior patients and he lives in a small studio apartment above a butcher's shop. Socially awkward Dr. Byun loves to read murder mysteries and avoids having lunch with his co-workers. The recent news declares the discovery of a torso revealed by the thawing ice of the Han River. The story makes him uncomfortable, as one of his patients, the father of the butcher who also happens to be his landlord, had talked in his drugged state about body parts during his colonoscopy. Dr. Byun's increasingly paranoid state begins to view his landlords suspiciously as he thinks he see's what looks like a head in a plastic bag in the butcher store's freezer. One night he got drunk with the old man's son, and wakes up to find a head in his apartment freezer. Events start spinning pretty quickly after this. He begins to see an older man sitting his clinic lobby all the time. One of the nurses has been stealing drugs from the clinic, and the police come by and tell him his wife is missing and he's the last one who saw her. It's pretty clear from the beginning the doctor is not playing with a full deck. The lingering shots of meat being butchered is creepy enough. The doctor's tiny studio that is filled with unpacked books lining up a wall contributes to his sad sack aura. Then there are his landlords that are overly kind and a bit sketchy filling the film with lots of red herrings. There are one too many "is it a dream?" moments. By the time the third act rolls around to clean up all the tiny loose ends it's at least satisfying to consider the doctor's paranoia may be somewhat justified.